700Credit invites dealers to participate in this complimentary webinar. Soft Pull, Prescreen, Pre-Qualification – these terms are gaining popularity in discussions at dealerships across the country. What do they all mean? Where are they utilized throughout your dealership? How are they the same or different? 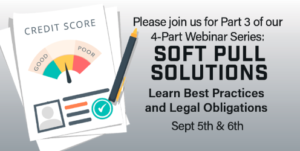 What are your compliance obligations around using a soft-pull? Many vendors offer these solutions today but not all are created equal. In this session, we will review the terms, the technology, and most importantly, your compliance obligations in using these solutions at your store.